It was only a matter of time before San Francisco’s flourishing tech scene was cited as a source of inspiration for a hotel or restaurant, but perhaps less likely that it would be applied in a tasteful manner. 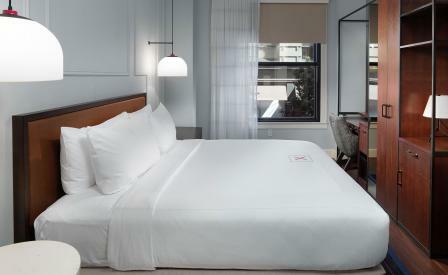 The Axiom, a boutique hotel located near the city’s busy Union Square, has managed to pull off such a feat rather neatly. Located in a building that was once the old Turpin Hotel — which dates to 1908 — and recently transformed by New York firm Stonehill & Taylor, The Axiom is both technologically advanced and contemporary, despite its historic setting. Welcomed via a dramatically lit tunnel, guests are given their first glimpse of The Axiom’s consistent references to both the city’s famous cable car system and its start-up culture on arrival. A network of lines, cables and connections symbolising the two appear throughout the entire property, via lighting wires and exposed pipes, amongst other things, and are a constant reminder of what the city now represents. Elsewhere, original iron railings, columns and moulding sit alongside newer innovations like ‘glitchings’ — digital portraits that morph into pixels and back again — while the clean, neutral palette of guestrooms is punctuated with shots of magenta and powder blue, brought together with luxe finishes, like leather headboards and mid-century styled furnishings. The Turn Café, a double-height venue serving dishes made with local and organic ingredients, serves as a metaphorical drawing board for guests and local alike, with a deconstructed chandelier looming large, perhaps waiting to indicate that next big lightbulb moment.